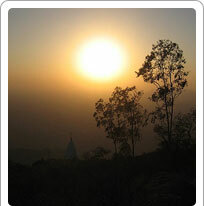 There are several view points in Mount Abu, to enjoy the beauty of the locales and the magnificent sunsets. Most notable among these is the Sunset Point. Every evening, hundreds of people gather here for the view' It has plenty of souvenir sellers as well, making for a carnival like atmosphere. Do reach early to get a good vantage point! It is located 2 km southwest on Sunset Point road. Access is free and open. Do remember to carry warm clothing. The other popular viewing point is called Honeymoon Point or Anadra Point and is located 2.5 km on Ganesh Road.